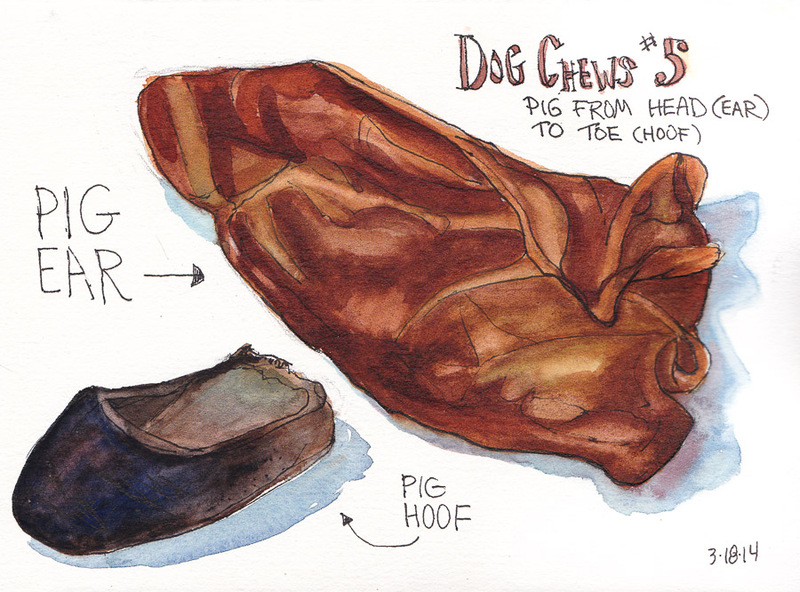 Second to last of the gross dog chew sketches: pig ears and pig hooves. While these are pretty nasty, they aren’t the worst. That comes next. Pig ears are pretty popular but they are definitely dog junk food, more like big, thick, greasy potato chips than rawhide. Millie ate half an ear in just a few minutes and it didn’t do her digestion any favors. I will not be buying them again. The hooves are not really digestible, they’re more for just the fun of gnawing on something and shredding bits off. They’re pretty hard so last a very long time. If they start to splinter or break they have to be thrown away, but they’re very cheap so I don’t mind.